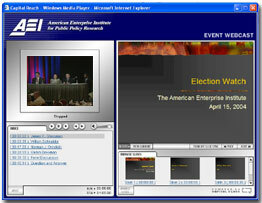 Custom Webcast Player Customer-branded browser window containing the interactive enhancements that the customer has ordered. 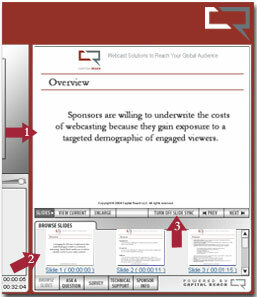 If the webcast has been sponsored, Capital Reach will customize the interface to properly display the sponsorship branding and additional information. 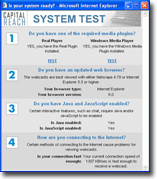 The Capital Reach webcast player supports Microsoft Windows Media Player and RealPlayer. 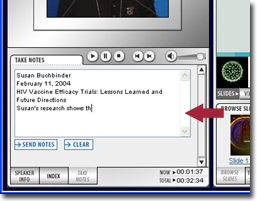 Indexing allows a viewer to seek to a specific point within a presentation without leaving the webcast player. Synchronized slides simulate the experience of an in-person PowerPoint Presentation placing an image of each slide in the webcast player and automatically changing the slide based on the audio/video presentation. Users may also be allowed to navigate slides manually. There is also a button to display a larger version of the image, which is useful for viewing detailed slides. 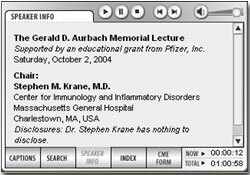 Thumbnail indexing provides a scrollable list of slide thumbnail images that a viewer clicks to advance to the point in the presentation when that slide is used. Our introductory slides option uses a customer-branded slide as the first slide of each speaker presentation. This provides consistency across speakers when the PowerPoint presentations designed by the speakers carry differing designs and layout of introductory information. 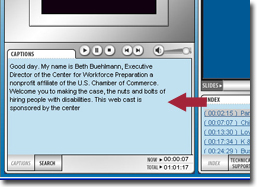 A user can send a note to themselves or a friend while watching a webcast without leaving the webcast player. This feature displays additional information about the speakers in the session which may include presentation title, speaker title, and affiliation. 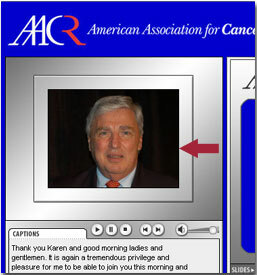 For audio webcasts, a speaker photo replaces the video image and changes with each presentation in a multi-speaker session. A critical part to the success of any conference webcast is sponsorship. Sponsorship provides a valuable source of funding to allow organizations to make more sessions available to their constituency. In addition, it can allow webcasts to become another source of revenue for organizations by allowing on-site conference sponsors to extend brand awareness beyond the physical meeting site. 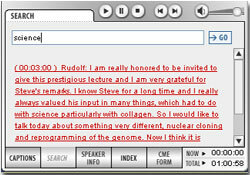 An easy to read text transcript of the audio is synchronized with the presentation. This feature is especially popular where English is a second language of the viewer or presenter, in either case making the audio presentation more difficult to follow. Multi-language transcription is also available. Seeks to points in the webcast where specific keywords are mentioned. Search is a no-cost upgrade for all webcasts with synchronized transcripts. An automatic system tester utility checks a viewer's system to ensure they have the required technology installed on their computer. 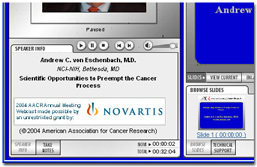 To reach those viewers where the online delivery of a webcast is not optimal, the sessions can be published to a CD-ROM.